Holiday baking is in full swing right now. It’s amazing how many wonderful and talented people are out there blogging and sharing their holiday specialties. I love how during this season our house smells of evergreen, cinnamon, orange and spice. One of my earliest recollections of these flavors are when my mom had us stringing popcorn for our tree. Our little fingers would be working feverishly as we were always rewarded with a plate of fresh baked cookies. I think we are all familiar with Luisa Weiss of the Wednesday Chef blog. Her latest cookbook; “Classic German Baking”, has been released and is full of traditional German and Central European recipes. The book is broken up into sections: cookies, cakes, yeasted cakes, tortes and strudels, savories, breads and rolls, Christmas favorites, and basics. Each recipe is formally introduced with a personal story or some type of historical information and the ingredients are listed in both American units and metric. My only wish was that this cookbook had more photos to go along with the recipes. After checking her website I noticed that Luisa has already taken care of that. She has included a link on her blog for those that has purchased her book and would like to see more photos. The photos are posted in the same order as the cookbook and will be updated until all recipes have at least one photo. 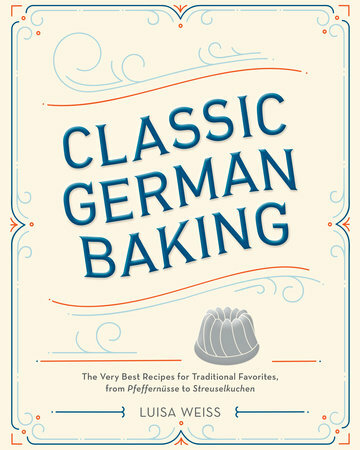 I would recommend this cookbook to anyone that enjoys classic traditional recipes that celebrate German and European baking. Indeed Holiday is all about baking. And these German Spekulatius cookies look so pretty and delicious, Cheri. Thanks Anu, it sure does seem like we do a lot of baking this time of year. Take care! o wir lieben Spekulatius! That sounds like a great cookbook. Thanks Angie, it is a great cookbook, I have many recipes tagged for the upcoming weeks. Can't wait! These cookies look wonderful, Cheri! I love traditional holiday treats! Thanks Susan, I love traditional treats as well. Happy Holidays!! Love Speculoos cookies and I love all the different variations. These look wonderful and I'm surprised you didn't have all the neighbors lined up with the wonderful aroma that must have wafted from your kitchen. Thanks Chris, yes I have to say with all the spices and orange and lemon peel the house did smell divine. Happy Holidays! What a perfect holiday cookie! German bakeries are so classic. This sounds like a fun book! Thanks Abbe, wish there was a German bakery in our neighborhood. I have Luisa's book and I just love love it. I just posted Basler Brunsli, one of the recipes in the book. I hope I have time to make Specoolus cookies. I used to have German wooden Specoolus cookie cutters but cannot find them. Happy Holidays Chris to you and your family. Thanks Gerlinde, hope you can find them, sometimes I put things in a special place, and they are never to be found again. Happy Holidays! I wonder why she didn't wait to publish after all the photographs were taken? Not sure Tandy, I think she focused on the instructions, they seem very detailed. It's been cookies galore here too and these ones look fantastic, Cheri! Love the flavors! Sounds like a great book too! Cheri, you've become so prolific I can hardly keep up in this holiday season! Plus, the gorgeous baked goods. The cookbook looks lovely and I do like the Wednesday Chef. The Spekulatius, Speculoos sound fabulous. On the photos, perhaps this leaves some room for yet another German Baking Cookbook by my favorite Kitchen Lioness, Andrea. Hi Peggy, Andrea should definitely write a book she is so talented. Her presentation is always spot-on. Wow - you and Gerlinde are on the same page! Love these cookies - and I know I would love this cookbook. Thanks! I know kind of crazy right, anyway happy Holidays to you and your family! They were super popular in Holland also..my friend when I was 10 was Gwen Brejaart..that's where I tasted my first speculaas..these look tempting! Traditional goodies are the best, love all the history and stories. Take care Monique, Happy Holidays! I am all about the holiday cookies these days, and this looks like a great one to trry! Thanks Sara, me too, so many great recipes out there. These cookies sure look great...spice and all...perfect for the Holiday...and the book sounds fantastic. Thanks Juliana, in this cookbook the instructions are detailed and precise, a real keeper. How neat that these are traditionally stamped. They sound really tasty! The holiday season is made all the more special when we start baking cookies…these sound wonderfully fragrant and delicious. I agree Karen, homemade cookies are the best. I love Christmas season too and baking and all smell amazing !! Thanks Shon, appreciate you stopping by. I love speculoos especially at this time of year! I have beautiful speculoos molds sent to me by a friend in Germany - never though of simply making them round! How special David, the molds must have a special meaning for you. These little cookies might look simple but I quickly realized there is much more to them. Luisa's book is very detailed and a great read. Speculoos are wonderful! As wonderful is your recounting of stringing popcorn to trim the Christmas tree <3 I could use a Cheri's cookbook with lovely personal stories. Ms Weiss' cookbook does sound great but it is nice to have photos alongside the recipe...Or maybe it's just smart to have the full edition on line..Anyway, happy season of baking! Hi Kim, her recipes are pretty detailed so maybe that is the reason. Yes, have been baking like crazy, having a lot of fun. Happy Holidays! These are a cookie I have on my to try list. I'm hoping the twins give me some time to bake them this year. Pinning! Thanks Amy, you must be pretty busy, this Christmas should be wonderful with your babies. Absolutely LOVE this post Cheri. My parents are German, and these cookies were always on our cookie platters over the holidays, yet I have never made them myself, now I totally have the recipe and cannot wait to make them, thank you! Hi Phi, I didn't know that. They must be over the moon with your good news. Happy Holidays! !